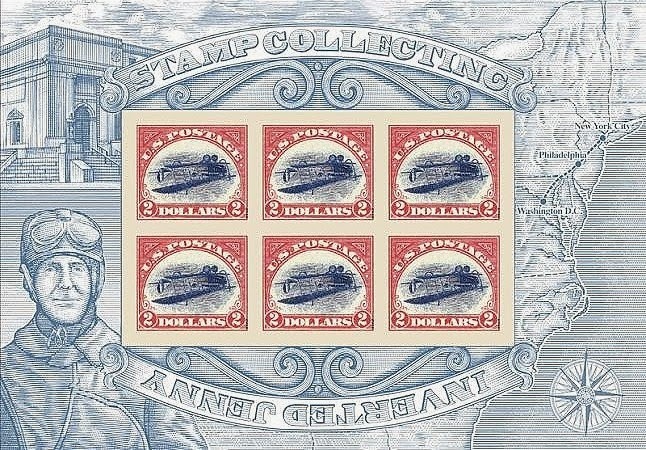 About 3 1/2 years ago, I suggested in a StampSelector article that the financially beleaguered Postal Service might raise funds by instituting a postal lottery, in which lucky collectors could win stamps issued in very limited quantities. Admittedly, the suggestion was not a serious one, because although the the USPS has made many idiotic mistakes in the last five decades, it's never promoted gambling or sunk to the level of a carnival tout. As it happens, it's taken my advice, at least generally, with its recent issuance of the $12 Inverted Jenny Souvenir Sheets, each of which contains six $2 stamps. The history of the original error (Scott #C3a) is well known to many U.S. collectors. In 1918, in a rush to celebrate the first airmail flight, the Post Office Department issued the 24 cent Curtiss Jenny stamp. Because the design required two colors, sheets were placed on the printing press twice - first to apply red ink and a second time to apply blue ink. 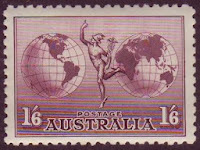 This process was prone to human error, as it allowed for the possibility that sheets might be inserted upside down, resulting in inverted center error stamps. A Washington, D.C. post office clerk who had never seen an airplane sold a sheet of 100 stamps mistakenly showing the biplane upside down to collector William T. Robey. Robey sold the legendary sheet of “Inverted Jennies” for $15,000 to dealer Eugene Klein, who then sold it to famed collector Colonel E.H.R. Green for $20,000. Colonel Green broke up the sheet and sold most of it over the years, keeping select examples, including one which he encased in a locket which he gave to his wife, Mabel. When offered, these stamps now sell for hundreds of thousands of dollars (up to $1 million, depending upon condition). The USPS recently issued 2.2 million of the $12 Inverted Jenny souvenir sheets, but this figure also includes 100 sheets with the biplane rightside-up - intentional "design errors" which correct the original design error of 1918. Actually, it is probably more accurate to call these items varieties. The sheets are being sold in shrink-wrapped packages, thereby rendering it impossible for buyers to see the design of each sheet. In effect, the USPS has instituted a lottery, motivating collectors to buy quantities of the $12 souvenir sheets in hopes of finding those with valuable "biplane rightside-up" varieties. The intentional issuance of an inverted center errors is not unprecedented. There are a number of developing countries (most notably Liberia) for which such errors are relatively common. In many cases such stamps were created by corrupt postal officials hoping to profit from sales to collectors.The editors of the Scott Catalog have stated that the new variety will not receive a major or minor Scott catalog number, though it will be described in a footnote accompanying the souvenir sheet's listing. As an intentionally created scarce variety, it violates Clause 6 of Scott's listing policy. Each purchase of one of the $12 sheets basically gives the buyer about a 1 in 22,000 chance of purchasing a variety sheet. 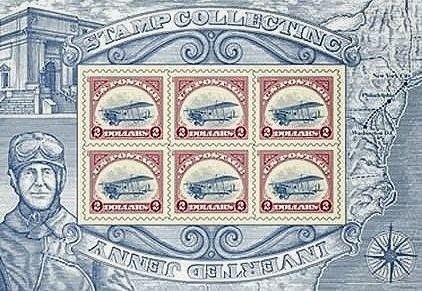 For those collectors, speculators, and dealers who might wish to enter this USPS lottery by buying large quantities of the sheets in hopes of acquiring the varieties, the key question to consider is whether the (currently unknown) market value of a variety sheet will more offset the probable loss incurred when unloading all of the normal ones. A prudent stamp dealer or speculator would consider the following before playing this game: 22,000 sheets will cost him $264,000.- (plus labor and expenses) and will probably yield him at least one variety sheet. Unless he does mass mailings, he will have to sell most of the rest of the sheets as discount postage, for around 70% - 75% of face value ($184,800 to $198,000.-, if all are sold at a discount). In other words, in order for this individual to break even on his gamble, he will have to be able to sell his Rightside-up variety sheet for at least $66,000.- (or $79,200-. if he unloaded the discount postage for 70%). Not bloody likely, in my opinion. Attempting to predict the probable long-term market value for such an item is an endeavor fraught with difficulty (and peril if one gambles on one's guess). The quantities issued are the same for both the original 1918 Inverted Centers and the 2013 "Biplane Rightside-up" variety souvenir sheets - 100 of each exist. 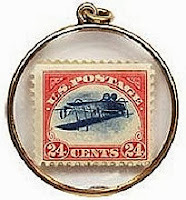 Much of the demand for the original Inverted Jenny stamps is based on their fame rather than scarcity - there are many stamps for which fewer than 100 examples exist (including inverted center errors) which sell for far less than C3a. In fact, there are many such stamps which sell for 1% or less of what a nice C3a will realize at auction. As for the variety souvenir sheets: based upon the values of comparably scarce legitimate U.S. errors, one might reasonably estimate that they will sell for a few thousand dollars each once the hype dies down. However, there are times when reason has little to do with the stamp market. Labels: EFO, Errors, General Commentary, Lottery, U.S.